To be able to use DPW Auctions or DPW generated PayPal links to sell your work in DPW, you have to set up your PayPal Express Checkout. No worries - this is free, quick, and easy to do! 1. DPW will be able to collect payments from buyers for your artwork and put the money directly into your PayPal account. 2. DPW will mark your work as sold and paid, and pull in the buyer's name, email address, and shipping address from PayPal without any data entry on your part! 3. DPW will calculate any required sales tax (or VAT) if you have opted in to DPW charging your buyers sales tax. 4. DPW will send both you and your buyer a convenient and easy to understand purchase confirmation email. First, you need to have, at least, a free business-level PayPal account (a Personal account will not work) and Express Checkout must be enabled in PayPal to allow you to use DPW generate PayPal links or DPW Auctions. Note: You do not need to have a business bank account or a business name to have a business-level PayPal account. All you need is a personal bank account. PayPal Will Ask: Integrate with an eCommerce Solutions Partner? When you upgrade, PayPal will ask you if you want to 1. Integrate with one of their eCommerce solutions partners, or instead, do you want to 2. Create buttons for your website. Unfortunately this choice is confusing the way they present it. PayPal should instead simply ask if you want to integrate with one of their eCommerce solutions partner, which you do not. Instead, you want to chose the option of not integrating , which means you have to chose the only other option offered, which is to create buttons for your website. What is important to understand is that you will not have to create buttons since DPW will easily and quickly generate PayPal links for you. You are simply choosing not to integrate with one of their eCommerce solutions partners. You need grant DPW permissions to create an Express Checkout PayPal page on your behalf. This will not give DPW access to any of your personal or financial information, but instead allows DPW to create a checkout page and put the money from the buyer's payment directly into your PayPal account. This is the same way it is done on Etsy and similar websites. Be sure to be signed into your DPW account first and then click here to grant permissions. Or, you can set up and verify your checkout from your my DPW Links drop down menu at the top of the DPW website. 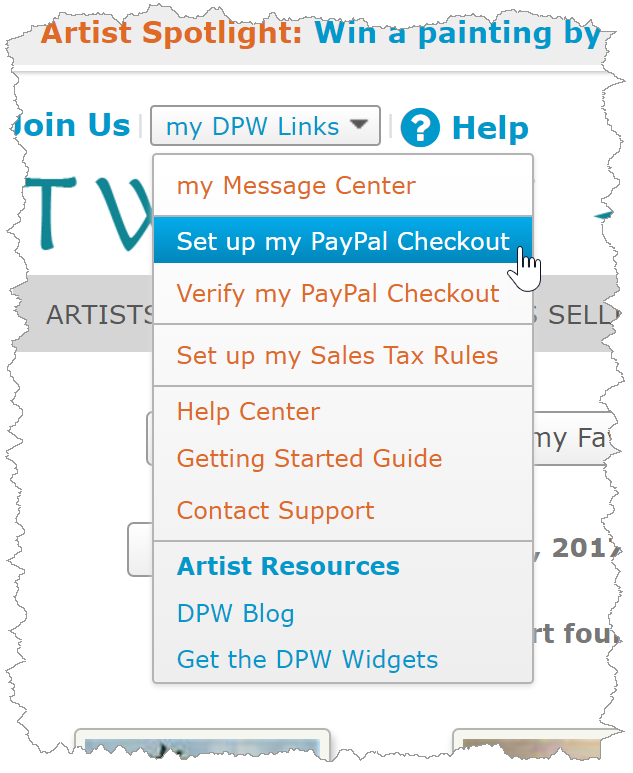 Finally, you can verify your set up by selecting the Verify my PayPal Checkout item in the my DPW Links menu on the front page that is visible when you are signed in, or in the my Selling Tools menu above your Art Tracking grid. Posted - Wed, Mar 19, 2014 at 8:19 PM. This article has been viewed 32132 times.